The compositions are finely detailed with a bevy of instruments – cello and violin feature predominantly, backed by flute, singing bowls, spanish bells, mandolin, harmonica, ukulele, and a variety of other non-conventional instruments. Martin’s playing is generally flinty, and he oscillates between backgrounds that are relatively sparse to other more heavily textured, a decision which allows the music to be both intimate and suggestive of a grand scale. 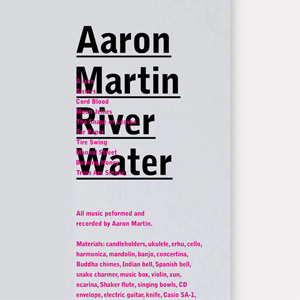 Martin casts a metallic burr over the conventional cello tone on Tar Paper, having it snake through a nest of woody guitar lines and the studied vagueness of the breathy background ambience with real charm and life. Martin then changes over to paired back, largely non-ruffled material, where the works are sturdy in tone, emphatic, and steadily expressive. Even here, in the more ecumenical passages, a certain eclecticism stretches out as though its shadow – scraped and bowed cymbals, fragmented rhythms, and other such nuances are subtly constructed, seeing to it that these pieces also remain intricately multifaceted scores. Martin’s strong melancholic signature remains intact; pieces still largely smoulder broodingly and occasionally ignite, they simply do so in markedly more variably textured, spacious and ultimately seductive realms. The only thorn in the album’s side is that all of the elements are never drawn together in a definitive manner. It’s a transitional album, one with many combinations of bright ideas.